Campbell College Belfast has received £90,000 from the Heritage Lottery Fund for a major restoration and education project titled, The Men Behind the Glass. Working alongside the Public Record Office of Northern Ireland (PRONI) and involving a cross-section of schools and communities throughout East Belfast, this project seeks to protect WW1 heritage held at the College and improve its interpretation by opening up the College archives for all. 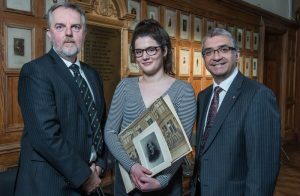 In the Central Hall at Campbell College the photographs of 126 pupils and one member of staff who lost their lives in WW1 sit embedded in the wood panelled walls. Deteriorating over time these images need to be preserved and digitally restored before they are lost forever. ‘The Men Behind the Glass’ will seek to protect these images, whilst uncovering the real life stories behind these men. 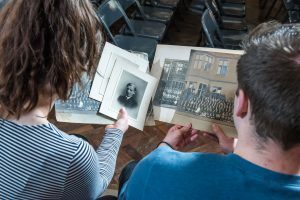 PRONI will work with the College to preserve and safeguard this important collection of photographs and create digital copies that will allow the College maximise opportunities for public interaction with the images and the stories behind them. In collaboration with the Schools and the wider community a ‘Poetry Slam’ event will be delivered as part of the EastSide Arts Festival in 2018 and a collaborative ‘Story Telling Workshop’ co-ordinated with a German school with Young at Art Events. These initiatives will be supported by a touring exhibition and an online forum all contributing to on-going learning and development as part of this project. In addition, the wider community will have opportunities to get involved with the research through a number of research workshops and sessions held at PRONI and at the College throughout the duration of the project. This entry was posted in Projects. Bookmark the permalink.